Whilst Wiggins is the great favourite for the race I think the next three weeks can bring plenty of surprises. But let’s run with the idea that Wiggins is the rider to beat, here are the suggestions from the team managers plus some extra ideas. Has Wiggins Peaked Too Early? This argument has been used before. Movistar’s Yvon Ledanois says “if all is managed properly it is possible to win the Dauphiné and Tour. But the Tour, it’s not one week, it’s not 20°C but 30°C degrees (86°F)”. He is right on the climate but this isn’t something that should worry Wiggins. He famously trained for the heat of Spain by turning up the heating in his hotel room and also using a garden toolshed with an indoor bike and heating turned up to the max. If anything the heat will be from the media, he can struggle sometimes with the daily press conferences, although he can lord it over the presspack as well. This is French for an off-day. You can be on form but still have a bad day when things don’t work out, the legs just feel wooden. With luck this happens on an ordinary day rather than a mountain stage or a time trial but there’s no choice. Saxo Bank DS Philippe Mauduit tells Le Quotidien this happened to Wiggins on the crucial stage of the Vuelta last year but was helped by Chris Froome. 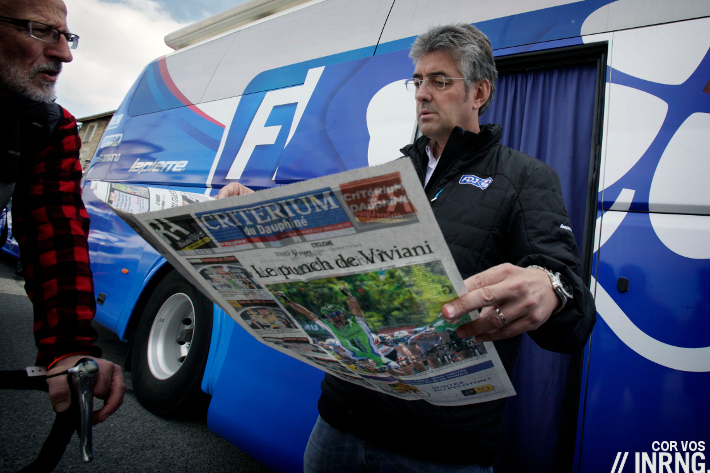 A bit of an obvious one but FDJ’s Thierry Bricaud warns of a crash. It’s true and nobody knows this more than Wiggins. The plan will be to keep Wiggins and Cavendish both near the front during much of the stage, one to avoid trouble and the other to set him up for the sprint. So long as Wiggins doesn’t sit on Cavendish’s wheel. Having the world champion and fastest sprinter on the team is normally a real asset but it means competing ambitions. Trying to achieve two objectives means using energy on the flat stages to help with the sprints. I also wonder about the mental aspect and team work. Hopeful all will go well but in the past Cavendish and Wiggins have had their differences and a mistake on the road could reheat old concerns. “Bradley has everything to win the Tour… but what’s missing is that he hasn’t had to meet many critical moments, the sort when you have to make up your mind on the road” says Marc Madiot of FDJ-BigMat. I think he’s got a point here but Sky seem so calm about things that they’re unlikely to panic. Wiggins’s race strategy will probably involve allowing rivals to attack whilst he and his team keep things under control. Those are the points listed by Le Quotidien but let’s go a bit further. There are a few more things that could prove his undoing. Wiggins is ultra lean and the change from hot weather to cold, especially rain, could get to him. During a stage the legs can seize up but longer term he’ll feel the cold. All riders have low bodyfat so this is relative but it’s another factor. In stage races in the past we’ve seen the media call on riders to form alliances to overturn another rider. But it rarely happens, riders have competing interests. Wiggins is strong but what if Porte, Froome or Rogers performs better? Will the team leadership change? There’s coping with changing strategies on the road and there are crashes that can put you our of the race. But all sorts of bad luck can strike in a race. A single bad meal can ruin everything; but the big teams bring their own chefs to help and food hygiene is as important as serving up carbohydrates. 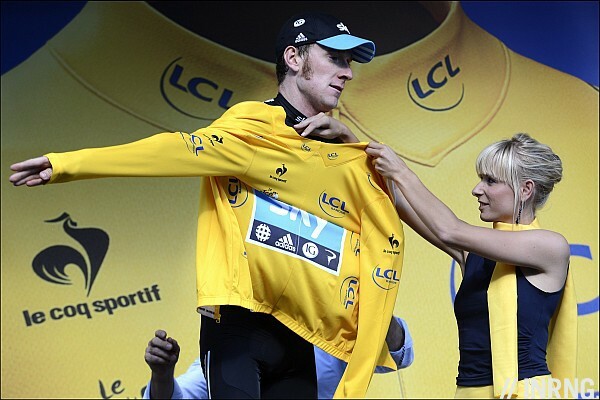 Talking of hygiene it is said Wiggins doesn’t shake hands with people so he can avoid their germs. But so much more can happen, whether the benign like a dropped chain or a puncture all the way to a rogue Eurovisions car or some other freak event. All this is before we consider the most obvious explanation of how to beat Wiggins: ride faster. The points above touch on this but Wiggins is far from a certainty implied by the bookmakers. When he finished fourth in 2009 he was sixth in the final time trial, strong but not the best; in the Vuelta last year he was beaten by Tony Martin and Froome. So even his strong points aren’t invincible. We’ll see how he copes with the mountains and a three week race. The route has been designed with the idea of forcing the climbers to attack to make up time they’ll lose in the time trials. But if that’s the idea, the execution of the plan is something else. First riders might be happy with a lesser place, especially since the UCI points can translate into big pay (14th place overall brings 20 points, as many as you get for a stage win) so they might prefer to avoid high risk long range moves. Second because these moves are sos obvious and even if riders can distance Wiggins mid-stage then Team Sky’s obvious strength can limit the gains of any bold attacks. One opportunity instead might be to attack when people don’t expect it; for example when there is a crosswind or to turn a transition stage into World War Three. But the probability of these moves happening, yet alone working, is low. He’s won week-long races this year but consistent riding in the world’s biggest bike race is taking it to a new level. I don’t see anyone beating Wiggins on descents. Andy Schleck isn’t great going down, either, but aside from his whining, Evans and company didn’t gain much attacking on the downhills. Evans kept his cards close to his vest in the late spring (as did Tony Martin, I think), particularly during the Dauphine. While Wiggins is certainly riding well, I don’t think he’s minutes better than Martin or Evans against the clock. The Cavendish factor will be interesting, for sure, particularly if Cav can win a few stages without a proper train. As he noted, taking the green this year will require intermediate sprint points, and without Sky controlling things, those might be hard to gobble up. Of course, I suspect that Cav has been promised full support in London for a gold medal run, so he may be willing to hang up his green jersey aspirations for one year. Evans has to leverage his one day abilities to force Wiggins and Sky to work hard on the transitional stages (no doubt riders like Sanchez and Hesjedal may be willing to go up the road, too). This will have the added benefit of making the race more interesting to watch–love him or hate him, Contador really animated the race last year by constantly attacking, regardless of the terrain. what a joke….sine when can Wiggins ride fast, technical downhills better than evans and co!! Cavendish has already stated that a green jersey isn’t the goal. He’s hunting for stages, and I’ll be shocked if he sticks around for the Pyrenees. The easiest way to unseat Wiggins is to just ride. One way or another, I see him defeating himself. Leipheimer has never been able to translate his strength in weeklong tours (including the Dauphine) to a grand tour victory. Evans has shown more endurance, but stop me if you’ve heard the one about him following wheels, limiting losses, and making it up in the time trial. It’s been a losing formula, and he would have lost again had he not taken initiative beyond that last year. You’ve got to take time in the steep climbs (like Cobo @ Angliru), and the downhill finishes. Plus, steal some time in one of the first week stages in an unexpected place. What GC favorite can do all 3? Answer me that, fellow Commentarios! Cavendish has shown in recent races he’s more than capable of acting as domestique to Wiggins – and can also haul himself up mountains much better than past tours. I think Cav’s a non-issue – his recent form shows he’s shifted his focus on the Olympic RR, but he’s also much better placed to win intermediate points like a true green jersey, as well as to pull for Wiggins in the mountains. With such a strong team around him, I can’t see this tour going to anyone but Wiggins, and all this talk is just making up column inches to try and persuade the casual observer the result isn’t a foregone conclusion. I dont think cav will be of any use climbing hills and acting as a domestique for wiggins, hes just not built for hills. Not having a good time on that stage, think he described it as “…a lonely day from hell”. Watching that you can see why, good job Bernie was there and thanks for the link. I’m not saying he will be a mountain goat in France but will be interesting to see what effect the weight loss and specific Olympics training has had. Given the ZLM Tour, especially the Ardennes stage, he may pop up on a few finishes you wouldn’t normally expect but how much of the top end has been sacrificed and in a year when Greipel, Kittel and Sagan are all going well too. All great points, but lets add another consideration. With a more ‘open’ tour for the top 5 spots, teams that would normally just be riding for publicity may now be riding to get on the podium. It changes the mental game. Letting a break go with Hoogerland or Flecha is a calculated risk. But what if Katusha or Rabobank decide that Menchov or Gesink can get to 5th place with a long and well orchestrated attack? In the past, other teams might have said “Sky, that is your problem” and Sky or BMC would say “we don’t much care.” This year, another 5 teams might want to fight for that 4th spot overall, and if so all the team tactics can go sideways. What if Omega thinks they can get two riders in the top 5? What will that mean to the tactics on transitional stages? BMC was well managed to deal with unusual tactics in 2011, it is reasonable to expect the same this year. Will Sky be able to deal with the unusual and weird? A simple tactical error at the wrong time can cost their leader the overall. If this year turns into a mental game, then you have Evans and Menchov and much of RadioShack and Omega with the experience and temperament to take advantage of that. Does Wiggins’ team have the maturity? I still hold that the Grand Tours are as much mental as physical. That may be a key place to attack Wiggins. One of the beauties of the Tour, Giro, and Vuelta is just how unpredictable they can be. That can work for or against any rider, including Wiggins. It works for the rest of us, and that is a joy! Wow, we’ve talked ourselves into an all-but-assured victory for a guy who’s never done better than third place in a GT (the Vuelta, at that). Not sure how we got here, but wow. Tell me the last time someone won the Dauphine in such convincing fashion, and followed this by a win in the TdF? Exactly. I almost need to keep typing “Bradley Wiggins Tour de France contender” as the act of seeing it on screen still needs some adjustment. I think people are simply looking at 100km of TT’ing, and the three stage race victories this season and assuming Wiggins will win. I can’t believe anyone who has watched cycling for any length of time will make the same assumption, he’s got everything to prove this year. The ingredients appear to be there to challenge, but as the blog lists there are so many variables which could see him falter. I have a nasty feeling he may crash again, or blow up badly in the Pyrenees, with victory in sight. Typical pessimistic Brit! The advantage that Sky has is that they are going into the race with four guys who could place into the top 10. People look at the results Wiggins has achieved and forget the top placings his team mates have managed despite riding on the front. One thing I would love to see is Sky taking the initiative. What I mean by that is to do the unexpected. Have Porte or Froome attack on the penultimate climb of a stage. Force the other teams to chase. Send a simple message to them – “we have multiple threats”. If Sky just team time trial on the front every stage it could be a very boring race. If they take the initiative they could manage something on a par with last year’s Vuelta. As for how to beat Wiggins. The answer is simple. Don’t just sit there and let Sky take charge. Disrupt them. Try attacks when they wouldn’t expect them. Don’t wait until the final two kilometers of a stage. Try putting your guys one the front on the penultimate climb, setting a hard pace and see if you can shell out the Sky boys. As much as people hype up the ride on the Joux Plane, they hit the top behind Quintana, who attacked from their group. Yes, he has great potential, but four riders in a group half a minute or so behind Quintana isn’t particularly remarkable to me. Or, is this a sign that Quintana was super human, defeating the Team Sky locomotive single handedly?! As a Brit, my dream should be a win from Wiggo. However, I actually have no desire for any specific winner. I would just prefer to see an attacking race, not just formulaic riding. One of the main reasons Sky are successful is because they plan to the nth degree. It clearly gets results, but they aren’t exciting. If cycling is to grow in the eyes of the public is needs an exciting Tour. Oh, and no drugs scandals this year please…. In general, the Tour is won by the best all-round rider and on that basis, on current form, Wiggins and Evans are favourites for good reason. It’s exactly the same reason that the Schlecks have struggled – they’re poor TT riders and poor descenders and they’re not good enough at anything else to compensate. Wiggins undoubtedly has weaknesses – his descending has never really been tested (although track riders are rarely bad bike handlers), he won’t respond to sharp accelerations on on climbs and he’s relatively inexperienced at leading a team in a GT. Wiggins winning the Tour would be a bit like Italy winning the world cup in 2006 – technically the best but perhaps not exciting to watch. As an admittedly biased Brit it would be great. I think it would probably be good for the sport to have an outspoken anti-doping TDF winner (something the press seem to be slow to pick up on). Good luck to him, but it’s going to be an interesting tour in so many ways not just the GC. Just as long as we don’t get a Greece 2004 TdF, although the underdog factor always charms me. Very good, thorough piece. I think the key is collective attacks on the mountains, that is, river-like breakaways by one team or alliance of teams. It will surely take exhausting, outclassing Team Sky. Otherwise, it’s the mix of Nibali, Sanchez and Evans escaping downhill, and the fact that the Tour’s last TT is like no other TT if the Tour has been raced hard. Lovely post and I agree, we all seem to be assuming that it is Wiggins’s tour to lose. You can’t translate a one week tour to a grand tour but nonetheless, I think 2012 results are a valid reason for Wiggins being labelled the favourite, not uninformed opinion. Could he ‘choke’ in the third week? Yes very possibly but based on what we know of 2012, he is the man to beat. Wiggins’s historic Grand Tour placing is not amazing but his form this year is extremely strong. If he crashes during the prologue on Saturday and doesn’t race again until September, 2012 will still have been an amazing year for Wiggins. He’s entered five races, quit one (bad weather in Catalunya) come first thrice and third once, winning four TTs on the way. No other GC contender comes close to that level of success this year. I think another weakness is the experience of management. for all their talk of marginal gains, no-one has been in the car when a GT has been won. Sean Yates is obviously their go to man for GT experience, but you can’t help but think there are guys in the other cars who’ve actually put a guy on the top step before, and that this has some advantages. I also think Wiggo is susceptible on the really steep stuff, and his team may not be able to ride tempo back up to the leaders when they hit this on the final climb, he may only lose 20-30s on these days but it adds up. And as you point out, his TT weapon isn’t as great in the third week – people are assuming he’ll get 1 minute on Cadel in each TT, given Cadel only lost 7s to Martin last year in Grenoble despite Martin soft pedaling the day before the TT shows Cadel knows how to be fast in the third week. Cadel would have beaten Martin in that TT, had he not been ordered to ease off by his DS, who feared he may overcook it after he had already dispatched of Andy. If Cadel rides the Tour like that again, Wiggo will be hard pressed to win I reckon. But that’s anything but a given – he had a special year last year. I think Wiggins is, at best, co-favorite with Evans. Evans is the champion, he’s probably a better climber, and he’s proven he can do it. This is, obviously, the best chance at winning Wiggins will ever have, so it’s logical to think that he’ll put on a good show–but we just don’t know if he can hang with the best for three weeks. What Evans and Wiggins both want is a conservative race with predictable runs up the climbs. It’s not going to bother them to see someone like Alejandro Valverde leap ahead of them at the line to gain 10 or 15 seconds. What will put them in a bind would be long-range attacks by outside GC contenders. Evans effectively limited the damage of one of those last year, but with so many TT miles, you have to believe that the climbers will be looking for opportunities to blow the race apart to gain chunks of time on the favorites. Even if such hypothetical tactics don’t work, they could make the difference for Bradley and Cadel. Evans in particular would probably appreciate the chance to make Sky work early and often in hard stages to isolate Wiggins on late climbs, the best chance Evans would have to take time from him in the hills. To beat Wiggins, a team will need to have a guy in the break every day and make Sky chase. Still, with so many TT miles, it’s hard to see Wiggins losing, as long as he keeps upright. Will the powermeters be banned same as earpieces to make racing more unpredictable? Would be great. H/R meters too. Of course only the display should be forbidden, you could log whatever you’d want. bring on the grande boucle……….. all the hype surrounding wiggins will surely mean another disaster for the guy with the worst socks in the peloton…and thats sayin somethin !!! As a very recent cycling follower I put this up somewhat gingerly. Not withstanding Wiggins’ superb year, the bookies have installed him a short favourite over Evans largely based on the Dauphine 53km TT. After that stage they pretty much swapped places & odds. By my reckoning of the video Wiggins was 8 secs behind Evans shortly after the 40.5km time check but Evans forced this back out to 17 secs at the finish. That by itself is interesting to think about, especially the tactics & psychology of that last 12km for both men. We also have the “dropped bottle” incident at the start for Evans for what its worth. Along with these factors I mainly wanted to get any opinions on this question. Given the really strong wind that day during the TT (Schleck blown off his bike), would a cyclist whose background comes from the track & with a better aerodynamic position/technique be better able to ride in those conditions? Maybe it helped Wiggins by 2 secs or 10 secs or..? Just putting it out there for you guys to comment. PS. My track cycling/wind “theory” holds up for the first 3 placegetters that day but fails miserably from then on!! what really helped Wiggins in that TT was his better form. the question is – has Cadel bridged that gap, since then? or can he bridge it over the period of the Tour (it’s so long and hard that they ride themselves into form over the race). only time will tell.. Interesting idea about Wiggins coping with the wind due to aerodynamics/track abilities, but a more likely and simpler explanation – he comes from an exposed archipelago. Even London is North of 51°. Unless you live at a high latitude near the sea I doubt most cyclist know what it is like to ride almost daily in windy conditions (just ask anyone from the Ireland Netherlands, Denmark or Norway). As a Briton nowadays living in inland France I find it is pretty calm here and when neighbours complain about the “tempête puissante” I feel what would be considered a “bit of a breezy day” in my native climes. You guys are over thinking. Both Wiggins and Evans are seasoned cyclists who have logged countless miles in every conceivable weather condition; “track background” or “mountain background” really don’t matter anymore. They both have plenty of skill–the strongest man will win. The keeping on 95% of his max performance level for 9-10 month a year, presented by Wiggos swimming coach, might prove to be a key factor in this years TDF. Will he fold in third week due to fatigue or will he ease through the very tour with his soft pedaling style only reaching his limits a very few times? I believe that the Cadel crew knows the sweat spot of Wiggo: his fragile mindset. And the Aussie is a master of waiting, calculating, holding back and then push as hard as possible when the time is right. (Galibier and TT last year). So when it all comes down to “killer instinct” between to almost equal riders – no swimming coach needed any longer. I go with Cadel as winner simply because of his experience, mental strength and proven killer instinct! Im not sure that Cadel is some kind of Jedi master when it comes to mind tricks. I seem to remember many commnetators describing his fragile mental state as his potential Achilles Heel. It is something that he has definitely worked on but to describe him as a master is pushing the boundaries a touch. Wiggins will no doubt be tested by the media scrum, especially if, as everyone seems to think, he does find himself at the front of GC. More serious to him is the threat of repeated attacking riding. As a previous poster remarked, that is what is going to disrupt his riding and rhythm. Since his MTB days Cadlel has proved his physical ability but until winning the rainbow stripes most people I know, including myself, saw him as strong but lacking initiative and not able to cope with pressure well. His body-language was insecure and he frequently looked cornered and something of a “Whinging Aussie”. Thankfully Evans has matured in to a confident and aggressive rider in the last two years and I’m glad to say I was wrong and kudos to him. I think Wiggins is another beast, he seems to be very self aware and calculating and his background with the British system plays to his strengths. He has transformed himself gradually but until recently has not really been in a position to have to prove himself in terms of mental toughness on the road. It was great to see Evans go on the attack in the Dauphiné but it was also impressive to see the Sky machine seemingly balancing the probable dangers versus the likely losses and letting him go (they certainly didn’t look like they were busting a gut to hold his wheel). Either way I hope one of the two wins. Bradley Wiggins affected by cold weather? He’s British and spent most of his time over the last few years training in Lancashire, one of the wettest counties in England. I’m sorry, but I can’t see it being a big deal. With Alberto and Andy in the mix this years race could have been a real vintage! but who knows, it may well still be. I bet Cadel is enjoying the heat being put on Bradley. It will be a close tour between Evans and Wiggins. Wiggins has good form, Evans has been improving through the season. Time differences will be small between the two on the TTs and the mountains. However riders have lost tours in the past from minor errors and incidents so cross-winds, crashes, splits in the peleton, etc so nothing is a given. Other teams will take advantage of the rivalry between Sky and BMC so expect lots of tactical riding with others looking to steal time at unexpected moments and put Evans and Wiggins on the back foot. Should be a great tour, bring it on! Evans is my favourite. He’s been there and is proven over 3 weeks. Bradley is clearly in great form and warrants being one of the contenders. If he doesn’t get on the podium it would be a surprise but there are a lot of stages where he could lose time. I expect there to be at least one puncheur challenging for the podium on the final TT. It’s all about not chrashing the first week. Especcialy stage 3 with its finish in Boulogne-sur-Mer might see some surprising results and will be good for a very, very nervous day. I don’t think he’s way more “favourite” than he should be tbh. Yes he’s won some big races but he has nt done it when all the contenders have been there on form and looking to win. Cadel has been there, done that. My biggest worry is that Sky will religiously stick to “the plan” even when it becomes clear that the tour is riding away from them, as in when Wiggins is really put under stress that he ll keep on chugging up, watching the powermeter and not react to what is actually happening on the road. Meanwhile Cadel will sneak away and gain a minute or so, which may be enough. Heart says Wiggo, Head says Cadel. Well, apart from someone just being better in the 3rd week, I think Vaughters has a plan to beat Wiggins. Sky will be marking a lot of riders, but there’ll always be someone they have to let go who they don’t consider an overall threat. Look at Westra in P-N. The trick imo is to make sure you get a big time gap in the early part of the race. The end of the first week. Vaughters is pushing Ryder as the GC man, but I suspect he’s trying to leave room for Dan Martin or Danielson to come from nowhere. Under the guise of chasing stages, someone could realistically take a minute on stage 7, hold on in the stage 9 TT and then try and follow for the rest. Providing they all get through the flat stages without indecent, I’m really looking forward stage 7. It’s interesting the queasiness that everyone seems to have with Wiggins as favourite. For many a fear of heart leading head and I guess the fact that he really hasn’t spent much time at the top table on the GTs. The fact for me – certainly in reading this thread – is that there is such a lack of other contenders. Certainly any to whom you can apply a rigorous argument for why they might contend! So it’s Wiggins or Evans. Or a shock. Do you think Wiggo could be the new Tim Henman? Tour on the same time of year as Wimbledon! You haven’t mentioned that a 3-week GT is a totally different beastie from a weeklong stage race. Btw, Andy Schleck isn’t riding as a result of a broken pelvis. Wiggo (great nickname – not) will not last the distance, the TDF line-up is a lot stronger than Roamanie or the Dauph plus it’s 3 weeks. In saying that the overall is perhaps more open than last year especially with Contador sidelined with a ban. After the shake-up at the Giro I’ll be watching Hesjedal in the GC and Sagan and Farrar in the sprints as Bingo Cavendish (aka Cav) has slimmed to last the distance and lost a bit of his straight-line speed as a result. Let’s not forget Alejet and Renshaw in the sprints either. Vino will be adding nuisance value too as it’s his farewell tour (again). Hmmm…Scarponi, Nibali, Basso (after wimping out when the Giro got tough) to come to the party? If his competitors go into this race, thinking that what they read/hear in media (and lets not forget he rides for a MEDIA/PR company) about how unbeatable he is is gospel then he has already won this race. The mental advantage that he will get from the hype not only helps him but can negatively affect his competitors, if they let it. So start by remembering he is not physically better than any other rider and must be “done over” by the bold strategy of attacking him and his team both EARLY and often in all mountain stages, and not waiting for the last few KMs on the one or two mountain top finishes. good comment. We have been saying the same at home. Sky, Murdoch, 97 million people market, of course everything will be geared to making him larger than life. But he sholud be selling a sports drink or something… all great TV personalities use their name for profit… Great Sports people, on the other hand quietly go about the job of winning Grand Tours and alike. My feeling is that Team Sky still haven’t mastered the tactics for a grand tour. It comes from Brailsford (and Wiggins) having a track mentality, where watts are the key and complex , joined-up thinking isn’t necessary. They screwed up the Giro for Cavendish in a simple case of poor tactics. Bossing a one week or less stage race against relatively weak opposition is not the same as winning a grand tour. Don’t waste your breath, save your energy for the final week. Remember, they’ll just have another excuse next year after DeliVan wins again. But this time it wont be a collarbone. So looking forward to the TDF12. This past year has been spent up late, scrolling through pages of online content and streaming race after race on Steephill & Cycling Fans. Thank you to those English speaking channels that don’t restrict their content to their own jurisdictions otherwise I would be forced to wait for SBS to televise Matt Keenans boring monotonous uninformative statistics driven drivel. Give me Phil or Bob or Sean any day, please. Onto wining a tour, or defeating Wiggins. I think BW’s greatest flaw will be his impatience. Watching his antics on the dais at Dauphine was typical. My GF was abhorred at the lack of respect he showed the organisers (ASO) when receiving the yellow during the early stages. In a grand tour, all that wasted mental energy will cost him dearly in the long run. DeliVan showed how one has to make a mental change as you grow to finally become an athlete that can recover and save enough energy to win the tour when it counts, stage 15 to 20. Another highlight was when he forged across to the BMC led group on the queen stage of Dauphine. The catch was a foregone. They weren’t going to make it to the next downhill to forge away. Wiggo got impatient with the grind and pushed across to DeliVans group. If I had been in that group and alert, I’d have jumped off the front with a team mate 10 to 15 seconds before he’d gotten there and seen if he had the legs to go a second time. His team would have also had a hard time bridging if the tempo had gone up. Finally, I listen hard to DeliVans reasons for leaving lotto. Team support and their desire for a Belgian GC Rider. Best results come from dedicated teams for GC. This is no week long, or 10 stage jaunt through the alpine foothills. Give a guy 8 riders who beleive in the cause and see what comes. Even then, Andy Schleck has shown that a full team dedicated to you, when you aren’t the right guy for the job, may only nab you a podium, not a win. Than is where he and Cadel differed, when he got the support he won(2011) or got into a winning spot before crashing (2010). Cav needs to crash out stage one, so Eisel can give his efforts to Wiggans, otherwise, he’ll bonk during either stage 17 or 19 and DeiselDeliVan will claim a second consecutive title, to add to the 2007 (loss to drug cheat) and 2008 (loss to crash and drug cheat) titles. If BW can stay upright, chill out and take it in his stride and avoid waiting energy, then he will have a tough final week where he and DeliVan can fight for the overall. Otherwise, Evans! A) He has prepared better than anyone else and is carrying the best form into the race. C) He has the best team around him. Fact. 1) Evans is not some ‘tactical genius’ who’ll bamboozle his way past a snoozy, dazed Wiggins to win. 2) Nibali just cannot descend fast enough to stay away from Wiggins and the Sky Train. There ain’t simply enough downhill miles in the race for that. 3) The Sky management are not clueless and inexperienced. They’ve been running a GT team for 3 years, people. 4) Bradley is not mentally frail. You try crashing out of the TdF when “in the form of your life”, then get up, dust yourself off and then go and take a podium in the Vuelta. In short, nobody — outside Team Sky, that is — has the legs to match their minerals. And that, Ladies and Gentlemen (tying neatly back to the OP) is how to beat Wiggins. So it won’t happen, will it? Interesting to read some of these comments. From my own point of view, having been involved in an equally tactical sport for many years I am surprised that everyone thinks Sky lack the tactical ability to handle the TdF. Tactical and strategic analysis is just that, experience matters very little (McLaren anyone?). While I am not saying Wiggo will win it you just have to look at the way Brailsford has built the GB cycling team (and Cav’s rainbow jersey) to have no doubt that they can match anyone for tactics. Collar bones of course, are a different matter. I think the leadership of Sky, unless Wiggins spectacularly blows up, is not going to shift. If he has a remote chance of the GC, Sky will back him. It’s a British team, he’s the biggest British rider (with the exception of Cav) of the moment and possibly of all time. If one of the other riders ends up better placed in the GC they may try to support both but it would take a lot for them to drop Bradley for someone else. Isolate early and often. The key is to stress Sky early and often. Put Wiggo in yellow early and make Sky pay the price of protection. Every time Cavendish sprints for road points immediately after that initiate breaks with strong lieutenants capable of causing a bit of bother. Alliances of the Italians and Spanish should stress Porte, Froome and Rodgers every time the road goes up hill, they should be hunting hilly stage placings. 3/4 of the way through the tour BMC, Garmin, Radioshack and Cannondale will start collectively turning the screw. Who will break and who will survive? Should make for good theater. I think Wiggins is a paper tiger. If the guy really can’t shake hand with folks for fear of catching something, forget it. How weak is that? Cadel Evans is tougher, has a team around him and he knows how to make difficult decisions in real time under pressure. Wiggo will wane on the hills, if he makes it there. Si un pistard gagne le Tour, on aura tout vu. My two pence. We shall see how it turns out. Not to take anything away from Wiggins, he’s been amazingly good this year, but I do think the aura of inevitability is a bit overdone. It’s a bit remarkable that with the defending TdF champion, the last four (official) Giro winners, and the last three Vuelta winners all in the race, a guy whose best GT was a Vuelta third (behind two guys also in this race) should be the overwhelming favorite. He’s in great form, the course suits him, many of those past winners are in decline… but still. It feels sometimes like they are trying very hard to convince everyone (including perhaps themselves) that they will win it, rather than just getting ready to go out and win it.